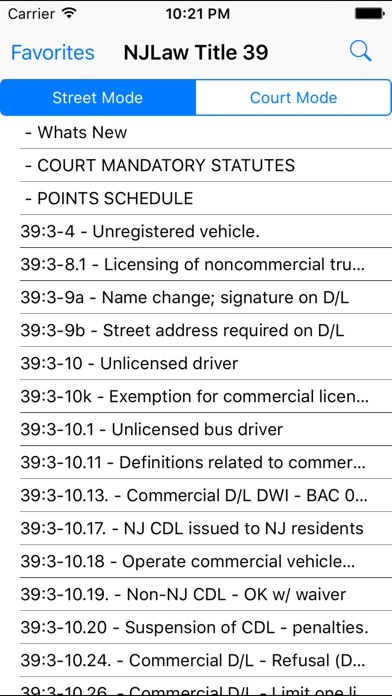 NJLAW Series - Motor Vehicle - Title 39 A complete list of the laws listed within Title 39, the New Jersey Motor Vehicle code. This app is designed for police and law enforcement professionals but could be beneficial to those who want to learn more about the laws of the State of New Jersey. 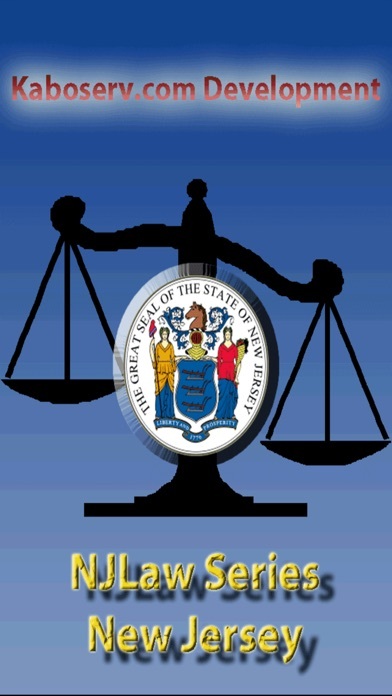 List screen covers all statutes with details and language from the law books of the State of New Jersey. Choose from street view or court view, search by title only or full text search. Now has easy to understand statute titles. PLEASE NOTE: This is MORE than just a list, if your select one of the statues listed on the main screen you will see the full text for that listed statute. Complete with search feature . Please contact me with any questions. This app is written by a police officer for other police officers and lawyers for ease of use. Please feel free to email any suggestions for improvement! **Also includes Points schedule and Mandatory Court appearance lists. Thanks for looking! Since the last update, the app has stopped working. It’s been about three weeks now and pretty frustrating. When it works it’s great. Update: Was contacted by the developer and the app has been fixed. I really like this app and would easily give it 4 or 5 stars except for the fact that it deletes your favorites after every update. Carrying my title 39 and 2C books in my duty bag gave me flashbacks to the academy and googling a statute or finding it on my hand written chicken scratch notes doesn't compare to having it all in one app, compact, easy and in order. The favorites make it an even quicker reference because obviously that's the statutes I use the most and it would be great not having to scroll through every law and re-add favorites every time there's an update. Erases my favorites when updating. The app itself is great! Only thing that is keeping me from giving it 5 stars is the fact that it ALWAYS erases my favorites. Still is a must have. 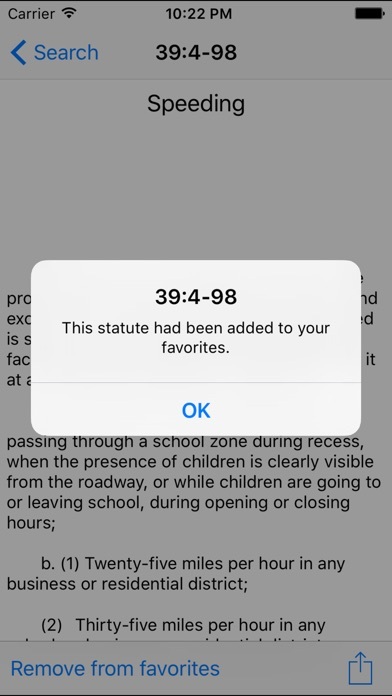 Love the app but an update on the statutes would be nice! I don't usually write app reviews, but when I saw that no one had reviewed this app, I felt I needed to write one. I have used this app and the companion Title 2C app for years now! These apps are by far the most fluid, helpful, clear, and powerful apps of their kind. Perfect for quick reference on a car stop or powerful text searching when assessing criminal charges - KaboServe reference apps are an essential part of every patrol bag. 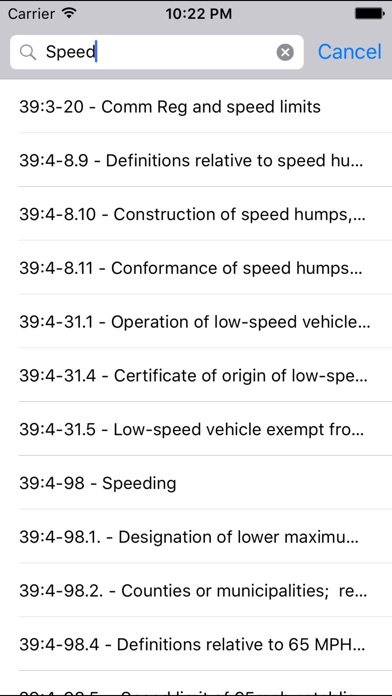 The apps are ALWAYS up-to-date with the latest statute changes and the developer is very good about making the apps easier, quicker, and more intuitive to use. There is no reason why these apps should not be part of your daily gear. Buy them, use them, and thank you to the developer! 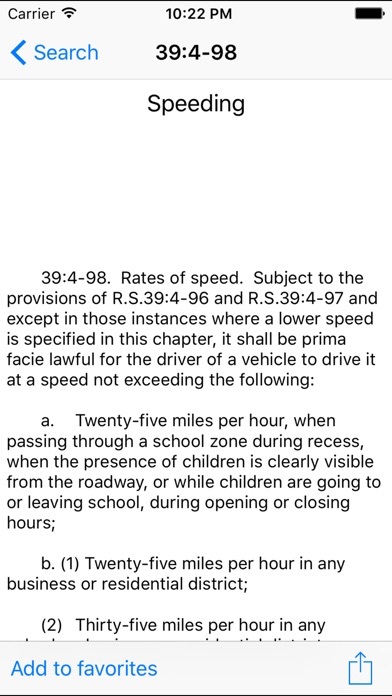 Please correct 39:4-82. Failure is spelled wrong so it does not come up in the search mode. By FARRRR one of the best apps on the market right now... So easy to use & a must have for ANY Officer on the road writing tickets!!! THANK YOU FOR THIS APP!!! I would have given it 10 Stars if I could!! !